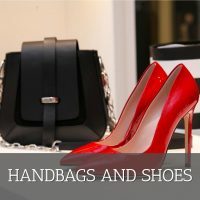 From elegant to casual the Amazon Handbags and Shoes department has the purse, sandals, and other accessories you need to achieve your ideal style. Browse leathers handbags, the latest shoe trends, and other accessories from design and contemporary labels like Calvin Klein, Anne Klein, GUESS and more. Use one of our Amazon Handbags and Shoes promo codes to get additional savings on fashion must-haves. Save 60.0% on select products from CIOR with promo code 601HH7GB, through 1/17 while supplies last. Save 60.0% on select products from CIOR with promo code 60GD48FM, through 1/17 while supplies last. Save 61.0% on select products from UBFEN with promo code 61YEEOGT, through 1/20 while supplies last. Save 62.0% on select products from Sunny Snowy with promo code 62INP6C2, through 1/18 while supplies last. Save 53.0% on select products from Sunny Snowy with promo code 53CEA4N9, through 1/18 while supplies last. Save 20.0% on select products from JENN ARDOR with promo code 20FKS25F, through 1/25 while supplies last. Save 20.0% on select products from JENN ARDOR with promo code 207DM99N, through 1/25 while supplies last. Save 20.0% on select products from JENN ARDOR with promo code 205RVCVH, through 1/24 while supplies last. Save 20.0% on select products from JENN ARDOR with promo code 2078NSTF, through 1/19 while supplies last. Save 20.0% on select products from JENN ARDOR with promo code 20WGS1YF, through 1/19 while supplies last. Save 30.0% on select products from JENN ARDOR with promo code 30YIR514, through 1/19 while supplies last. Save 30.0% on select products from JENN ARDOR with promo code 30N3J3A5, through 1/24 while supplies last. Save 20.0% on select products from JENN ARDOR with promo code 20GE1M6H, through 1/24 while supplies last. Save 35.0% on select products from JENN ARDOR with promo code 353ZLMEM, through 1/18 while supplies last. Save 25.0% on select products from JENN ARDOR with promo code 25814QZK, through 1/24 while supplies last. Save 65.0% on select products from JENN ARDOR with promo code 65BM412I, through 1/31 while supplies last. Save 35.0% on select products from JENN ARDOR with promo code 3592PJ5M, through 1/18 while supplies last. Save 25.0% on select products from JENN ARDOR with promo code 25WDQYH9, through 1/19 while supplies last. Save 60.0% on select products from COCOHOME with promo code 605IO7G4, through 1/17 while supplies last. Save 60.0% on select products from CIOR with promo code 60YMWNC7, through 1/17 while supplies last. Save 40.0% on select products from YS\u00B7AU with promo code 407QGXGM, through 1/24 while supplies last. Save 40.0% on select products from YS\u00B7AU with promo code 404ZTFFM, through 1/24 while supplies last. Save 65.0% on select products from EDODAY with promo code 658DMRBB, through 1/18 while supplies last. Save 50.0% on select products from JIASUQI with promo code 50ZORNI4, through 2/15 while supplies last. Save 61.0% on select products from UBFEN with promo code 612O96OZ, through 1/21 while supplies last. Save 50.0% on select products from CIOR with promo code 508JTPQR, through 1/22 while supplies last. Save 51.0% on select products from Centipede Demon with promo code 51PLKD56, through 1/31 while supplies last. Save 70.0% on select products from Harrms with promo code 70ZOHRBE, through 1/17 while supplies last. Save 53.0% on select products from Sunny Snowy with promo code 53XPH36W, through 1/17 while supplies last. Save 70.0% on select products from SOJOS with promo code 700SOJOS, through 2/14 while supplies last. Save 60.0% on select products from SOSUSHOE with promo code 605SLNA7, through 1/18 while supplies last. Save 60.0% on select products from SOSUSHOE with promo code 60B64L4S, through 1/18 while supplies last. Save 60.0% on select products from SOSUSHOE with promo code 6089T5TU, through 1/18 while supplies last. Save 70.0% on select products from Ermonn with promo code 70IO2T72, through 1/22 while supplies last. Save 70.0% on select products from Ermonn with promo code 70KQ7FZE, through 1/22 while supplies last. Save 30.0% on select products from BODATU with promo code 30VHAI52, through 1/22 while supplies last. Save 60.0% on select products from Alloda with promo code 60YIPLZX, through 2/14 while supplies last. Save 60.0% on select products from Alloda with promo code 607NUI1M, through 2/14 while supplies last. Save 70.0% on select products from Ermonn with promo code 70FAY8XQ, through 1/22 while supplies last. Save 61.0% on select products from UBFEN with promo code 61PVMD9S, through 1/20 while supplies last. Save 30.0% on select products from ONEMIX with promo code 30XD48M7, through 1/31 while supplies last. Save 65.0% on select products from EDODAY with promo code 65PY5W4X, through 1/17 while supplies last. Save 61.0% on select products from UBFEN with promo code 61SZRKQB, through 1/19 while supplies last. Save 41.0% on select products from KUBUA with promo code 41P7YWTH, through 1/31 while supplies last. Save 50.0% on select products from GUBARUN with promo code 50DBCANL, through 1/23 while supplies last. Save 75.0% on select products from vegoos with promo code 758IZEN6, through 1/31 while supplies last. Save 75.0% on select products from vegoos with promo code 75WWDQ1U, through 1/31 while supplies last. Save 75.0% on select products from vegoos with promo code 75UCW1XT, through 1/31 while supplies last. Save 75.0% on select products from vegoos with promo code 7599OJXK, through 1/31 while supplies last. Save 30.0% on select products from BRUWEN with promo code 308L2HNM, through 1/21 while supplies last. Save 60.0% on select products from EyeGlow with promo code 605DSOBB, through 2/10 while supplies last. Save 60.0% on select products from Fashare with promo code 60X3HRWF, through 1/17 while supplies last. Save 70.0% on select products from Syktkmx with promo code 70FPN7GF, through 1/21 while supplies last. Save 70.0% on select products from Syktkmx with promo code 70MRHUNL, through 2/12 while supplies last. Save 70.0% on select products from Syktkmx with promo code 70VZUPZ8, through 2/12 while supplies last. Save 70.0% on select products from Syktkmx with promo code 70G4E3CC, through 2/12 while supplies last. Save 70.0% on select products from Syktkmx with promo code 70TPL9DO, through 2/12 while supplies last. Save 61.0% on select products from UBFEN with promo code 61WV52IJ, through 1/19 while supplies last. Save 15.0% on select products from SOXICK with promo code 15KASA2P, through 1/17 while supplies last. Save 15.0% on select products from SOXICK with promo code 15QVYCU4, through 1/17 while supplies last. Save 60.0% on select products from SOSUSHOE with promo code 60GLD35D, through 1/17 while supplies last. Save 60.0% on select products from SOSUSHOE with promo code 60FG24FD, through 1/17 while supplies last. Save 60.0% on select products from SOSUSHOE with promo code 60CPO2OZ, through 1/17 while supplies last. Save 50.0% on select products from SOSUSHOE with promo code 50A8385H, through 1/17 while supplies last. Save 50.0% on select products from EyeGlow with promo code 50AO3BXE, through 2/10 while supplies last. Save 50.0% on select products from VIPPLUS with promo code 50EU1G97, through 1/18 while supplies last. Save 11.0% on select products from iGuaneye with promo code 11IGUANEYE, through 2/12 while supplies last. Save 61.0% on select products from UBFEN with promo code 61IP6Z1X, through 1/27 while supplies last. Save 30.0% on select products from JUSTFASHIONNOW with promo code 30XEEPHL, through 1/27 while supplies last. Save 61.0% on select products from UBFEN with promo code 61H1ZAQ8, through 1/26 while supplies last. Save 70.0% on select products from Ermonn with promo code 70FVLSWK, through 1/19 while supplies last. Save 70.0% on select products from Syktkmx with promo code 70FUET7J, through 2/12 while supplies last. Save 70.0% on select products from Syktkmx with promo code 70D3BYJE, through 2/12 while supplies last. Save 70.0% on select products from Syktkmx with promo code 70ZVFTRY, through 2/12 while supplies last. Save 70.0% on select products from Syktkmx with promo code 70A1UMYH, through 2/12 while supplies last. Save 61.0% on select products from UBFEN with promo code 61IWYTIX, through 1/23 while supplies last. Save 30.0% on select products from EyeGlow with promo code 30YZMI67, through 2/10 while supplies last. Save 55.0% on select products from EyeGlow with promo code 55DYGBRE, through 1/31 while supplies last. Save 61.0% on select products from UBFEN with promo code 6135WOKT, through 1/18 while supplies last. Save 60.0% on select products from UBFEN with promo code 60NH4VAQ, through 1/22 while supplies last. Save 10.0% on select products from Syktkmx with promo code 106H3DJ6, through 2/10 while supplies last. Save 25.0% on select products from HOBIBEAR with promo code 258UGV5D, through 1/18 while supplies last. Save 75.0% on select products from EyeGlow with promo code 757AF18C, through 2/5 while supplies last. Save 72.0% on select products from moonlight elves with promo code 72FQIQ95, through 2/8 while supplies last. Save 15.0% on select products from MSMAX with promo code 15P12015, through 1/25 while supplies last. Save 15.0% on select products from MSMAX with promo code 15MSMAX13, through 1/20 while supplies last. Save 50.0% on select products from West Bay Inc. with promo code 50HBUKU5, through 1/31 while supplies last. Save 50.0% on select products from SunglassUP with promo code 50GO9M6O, through 2/8 while supplies last. Save 50.0% on select products from SunglassUP with promo code 50XG86Z7, through 2/8 while supplies last. Save 55.0% on select products from LANPA with promo code 55AAB91P, through 1/18 while supplies last. Save 30.0% on select products from Zcoli with promo code 303KB9T6, through 1/20 while supplies last. Save 71.0% on select products from moonlight elves with promo code 71RWU695, through 2/7 while supplies last. Save 50.0% on select products from SunglassUP with promo code 50TJR82L, through 2/8 while supplies last. Save 30.0% on select products from STENFFY with promo code 309394ON, through 2/6 while supplies last. Save 15.0% on select products from ROWOO with promo code 15ROWOOYP, through 1/24 while supplies last. Save 72.0% on select products from moonlight elves with promo code 722Q8T2W, through 2/6 while supplies last. Save 50.0% on select products from Centipede Demon with promo code 50JVFERB, through 1/25 while supplies last. Save 5.0% on select products from JUSTFASHIONNOW with promo code 05KSVEGZ, through 2/5 while supplies last. Save 40.0% on select products from Centipede Demon with promo code 40HOET83, through 1/25 while supplies last. Save 30.0% on select products from DREAM PAIRS with promo code 30LAT8CX, through 2/5 while supplies last. Save 15.0% on select products from HTMS with promo code 15CHGT4X, through 2/5 while supplies last. Save 15.0% on select products from HTMS with promo code 15HMBG64, through 2/5 while supplies last. Save 35.0% on select products from Centipede Demon with promo code 353YRGBB, through 1/27 while supplies last. Save 70.0% on select products from Vanbuy with promo code 70EJEPUF, through 1/31 while supplies last. Save 15.0% on select products from RAYDESTINN with promo code 15C9D5SB, through 1/31 while supplies last. Save 51.0% on select products from Centipede Demon with promo code 513K43YU, through 1/25 while supplies last. Save 40.0% on select products from ROCKROOSTER with promo code 40JF4MGR, through 1/23 while supplies last. Save 35.0% on select products from DREAM PAIRS with promo code 35JNWWNQ, through 1/31 while supplies last. Save 20.0% on select products from Ali&Alex with promo code 20ALIALEXCHI, through 2/4 while supplies last. Save 20.0% on select products from Ali&Alex with promo code 20ALIALEXOUT, through 2/4 while supplies last. Save 30.0% on select products from LOYOMA with promo code 30WWE7PO, through 1/20 while supplies last. Save 15.0% on select products from JCTHBAG with promo code 15P4BY7K, through 2/2 while supplies last. Save 15.0% on select products from JCTHBAG with promo code 15PL826Y, through 2/2 while supplies last. Save 70.0% on select products from Syktkmx with promo code 70I5Q7LN, through 1/31 while supplies last. Save 60.0% on select products from Syktkmx with promo code 60DF9BKF, through 1/31 while supplies last. Save 60.0% on select products from Syktkmx with promo code 60FGC5IT, through 1/31 while supplies last. Save 70.0% on select products from Syktkmx with promo code 70RRA1MO, through 1/31 while supplies last. Save 60.0% on select products from Syktkmx with promo code 601EHZMH, through 1/31 while supplies last. Save 70.0% on select products from Syktkmx with promo code 70VE879C, through 1/31 while supplies last. Save 60.0% on select products from Syktkmx with promo code 607JO3ZU, through 1/31 while supplies last. Save 60.0% on select products from Syktkmx with promo code 60QKAZ6F, through 1/31 while supplies last. Save 70.0% on select products from Syktkmx with promo code 70ZH85NL, through 1/31 while supplies last. Save 70.0% on select products from Syktkmx with promo code 70SYDGXS, through 1/31 while supplies last. Save 60.0% on select products from Syktkmx with promo code 60FUMLMH, through 1/31 while supplies last. Save 50.0% on select products from Syktkmx with promo code 50EAH5A1, through 1/30 while supplies last. Save 65.0% on select products from Syktkmx with promo code 65WCZNOA, through 1/31 while supplies last. Save 5.0% on select products from HotOne with promo code 05NKKYKU, through 1/31 while supplies last. Save 15.0% on select products from TESENMA with promo code 15NR7OYD, through 1/29 while supplies last. Save 70.0% on select products from Syktkmx with promo code 70Q9DLLN, through 1/30 while supplies last. Save 70.0% on select products from Syktkmx with promo code 704B73YD, through 1/30 while supplies last. Save 70.0% on select products from Syktkmx with promo code 70U1XJRN, through 1/30 while supplies last. Save 70.0% on select products from Syktkmx with promo code 70DWLJ4U, through 1/30 while supplies last. Save 25.0% on select products from Revs with promo code 2552HPGW, through 1/27 while supplies last. Save 30.0% on select products from BRUNO MARC NEW YORK with promo code 30XEIB1Q, through 1/27 while supplies last. Save 50.0% on select products from SunglassUP with promo code 50HERYD4, through 1/27 while supplies last. Save 30.0% on select products from TOETOS with promo code 308KHIXK, through 1/26 while supplies last. Save 30.0% on select products from DREAM PAIRS with promo code 30OWWK24, through 1/26 while supplies last. Save 30.0% on select products from DREAM PAIRS with promo code 302QJFDQ, through 1/26 while supplies last. Save 30.0% on select products from DREAM PAIRS with promo code 30NXD3Z1, through 1/26 while supplies last. Save 30.0% on select products from DREAM PAIRS with promo code 30NCCPXE, through 1/26 while supplies last. Save 10.0% on select products from Syktkmx with promo code 10VM7Q99, through 1/25 while supplies last. Save 45.0% on select products from UJoowalk with promo code 45KNT8IS, through 1/25 while supplies last. Save 45.0% on select products from UJoowalk with promo code 45Z3PCN3, through 1/25 while supplies last. Save 50.0% on select products from Epicstoke with promo code 50PROSTOKE, through 1/24 while supplies last. Save 50.0% on select products from EyeGlow with promo code 50T8UJYN, through 1/23 while supplies last. Save 5.0% on select products from UJoowalk with promo code 05ZU7ZGV, through 1/23 while supplies last. Save 5.0% on select products from UJoowalk with promo code 05WJLSGB, through 1/23 while supplies last. Save 70.0% on select products from SOJOS with promo code 70SOJOSJEY, through 1/23 while supplies last. Save 50.0% on select products from FEETCITY with promo code 50FO6AXI, through 1/22 while supplies last. Save 15.0% on select products from HTMS with promo code 154F7GSO, through 1/20 while supplies last. Save 60.0% on select products from SOJOS with promo code 60SOJOSRRY, through 1/17 while supplies last. Save 70.0% on select products from SOJOS with promo code 70SOJOSJER, through 1/17 while supplies last. Save 40.0% on select products from ZOCAVIA with promo code 40RFDCXB, through 1/17 while supplies last.